At the risk of sounding purely contrarian, I have long believed that the film is not all it’s cracked up to be. In terms of cinematography, sound design, and art direction, deeply admirable work was done by all involved. A number of excellent performances (including those by Liam Neeson, Ralph Fiennes, and Ben Kingsley) also add value to a production that is difficult to entirely dismiss. But ultimately, Spielberg’s best film of 1993 was Jurassic Park in terms of achieving what it set out to do. His reframing of the Holocaust in “feel-good,” positive terms was irresponsible, paving a road that eventually led to the blatantly exploitative (and inexplicably well-received) revisionism of Quentin Tarantino’s Inglourious Basterds. First, let me say the Blu-ray looks extraordinary. The award-winning black-and-white cinematography by Janusz Kamiński has truly not looked better since 35mm prints were first assembled and exhibited 20 years ago. The high definition transfer retains all the film-like qualities intended by Kamiński and Spielberg, the latter of whom supervised the restoration process. Less immediately impressive is the 5.1 DTS-HD MA mix, but only because it is as restrained as it always was—mostly residing in the front channels, but expanding to the rears effectively when appropriate. Simply put, I can’t imagine a more exemplary technical presentation of this film. If you already love it, do not hesitate about adding it to your Blu-ray collection. 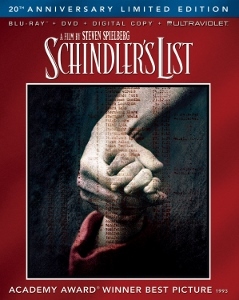 Spielberg chose to adapt the novel Schindler’s Ark by Thomas Keneally. The novel is based on the real life of Oskar Schindler, an enigmatic, opportunistic, Nazi businessman who operates an enamelware factory. Schindler employed numerous Jewish workers, at some point becoming aware that he had the power to save his employees from execution. He is credited with having saved some 1,200 Jews. Since the novel’s publication in 1982, a more complete account of Schindler’s life has emerged in the form of David Crowe’s Oskar Schindler: The Untold Account of His Life, Wartime Activities, and the True Story Behind The List. That Spielberg chose to base his semi-fictionalized film on a semi-fictionalized novel calls into question the film’s validity as a reliable commentary on the Holocaust. That’s not to say that all films based on (or inspired by) true events are invalid simply because they take inevitable liberties with facts. But it does become a particular problem when a given film becomes embraced as an “educational” resource. What Spielberg did in crafting his cinematic approximation of the Holocaust was focus on one of the relative few “happy” stories amidst one of the most horrific chapters of human history. Spielberg idealizes Schindler, choosing to make him a beacon of light in the darkness, fully conscious of his virtuous deeds. Not only did Schindler’s climatic breakdown (“I could’ve saved more,” he sobs) never occur (not even in the novel) it has been invented as a way to comfort audiences at the end of three hours of depressing, soul-deadening evil. Spielberg just couldn’t resist, apparently. Again, it’s not that there aren’t positive, artistic elements within the film. But for schools to screen Schindler’s List for students as a way to conveniently “cover” the Holocaust (as has happened countless times over the last 20 years) is disturbing. The Holocaust has been well-documented in books and documentaries, whether brief or exhaustive (Night and Fog: 30 minutes, Shoah: more than 9 hours). While it isn’t a “bad” movie, Schindler’s List should not stand on its own as a person’s sole “knowledge” of the Holocaust. In the end, it is a commercial product that (perhaps despite Spielberg’s intentions) managed to reduce one of the defining events of the 20th century to “pop culture phenomenon” status. How many young people have grown up with Schindler’s as their only “education” of the atrocities Hitler and his regime committed? This isn’t Spielberg’s fault, per se. But he knows (probably better than most of us) just what hold Hollywood productions have over the world’s population. He’s not the first person to make a fiction film based on the Holocaust, but his is the most-seen and most-decorated. He made the choice of crafting a story that allows audiences to emerge hopeful and happy, crying tears of joy. However harrowing much of the imagery is, in the end we—the audience members—are let off the hook. While not the grotesque display of trivialization that Tarantino concocted with Basterds (in which we are asked to revel in the “defeat” of Hitler and Goebbels by way of a revenge fantasy), Schindler’s List is nonetheless a piece of historical revisionism on a more subtle level. I don’t think there is any particular harm in viewing Schindler’s List but I don’t consider it to be either Spielberg’s finest hour nor the “work of art” it is so often described as. At best, it might inspire individuals to seek out more authoritative historical documents about the Holocaust. For anyone with a serious interest in learning about the subject, I don’t believe the film has any particular educational or philosophical value. I would love to own this film on Blu-ray. It was one of the best films of the 1990s.